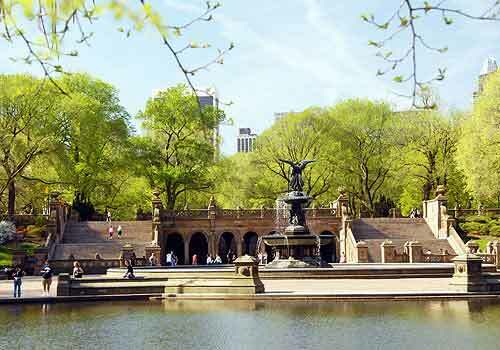 Bethesda Terrace is considered the heart of Central Park. In their original plan, Park designers Frederick Law Olmsted and Calvert Vaux envisioned a sweeping Promenade (the Mall) that led to a grand terrace overlooking the Lake. The magnificent carvings represent the four seasons and, on the side facing the Mall, the times of day. Today, Central Park Conservancy employs a sculptor to care for the sandstone carvings and sculpture and a zone gardener and their crew to take care of the landscapes. In the summer, aquatic plantings such as water lilies and lotus are placed in the fountain, reviving a 19th century tradition.